When you write a conclusion for the project, always remember that you have to make a summary of the content as well as the purpose that you have in mind without looking way too wooden or dry. Most conclusions of the project tend to have a couple of key elements. Of course, there are some tactics that you should be using if you want to write a conclusion that is effective. Plus there are some things that you should avoid as well. On that note, here are the couple of tips that you should keep in mind before writing a new research paper. The following tips in this category will help you avoid making mistakes while writing a conclusion for the project. So read them carefully before you actually start off! This is a very important tip to remember when you are writing a conclusion for project work. This also includes the summary as well as the closing. The sayings tend to sound very unnatural and slightly tough and they definitely don’t sound professional. Plus if you tend to use phrases like ‘I would like to say in conclusion’, then you tend to come across as a bit too straightforward and end up giving a conclusion that is weak and disappointing. If you want to put a strong one out of there, you have to make sure it stands out. Only that can help you make a good impression. It could be slightly tempting to keep your thesis for the end so that you can keep the readers in suspense and give that dramatic end. Though this makes your paper comes across as good and well written, we would definitely suggest you not to make that mistake as it looks very less cohesive and hardly organized. You should always keep the main point of your argument in the introduction itself. The research paper doesn’t have to become some kind of a mystery novel. Second, a good paper will let the reader understand your argument from the beginning to the end. Whenever you mention an idea that is new or subtopic or some kind of recent evidence that you think is significant, you don’t always have to mention it towards the conclusion of the paper. You have to mention all that is important in the introduction of the paper. There could be some kind of supporting evidence by the side but you have to make it look well written and properly detailed. Also, the conclusion will help you to narrow the whole topic down to a simple point. If you want you could also make some sort of suggestion in case your reader wants to do some research later on. No matter what you do, do not ever make the mistake of changing the tone of the paper. It should always be consistent the whole time. You need to have some sort of an academic tone and give some sort of conclusion that is emotional or sentimental. Even though the topic you are writing on doesn’t have much significance, do not strain too much on it. Plus maintain the consistency throughout and if you want to make it look more humanistic, you may begin and end with an anecdote. That will work! There is no reason for you to make those statements that can downplay the authority that you have as well as the discoveries. If you put up statements that are apologetic or have phrases like ‘I am not an expert or something’, then it could get a bad grade! You should also avoid using statements that come with the first person. Also, remember that the first person is not really considered to be formal and it really does not match with the formal tone in any kind of research paper. How to Write a Conclusion for Project Which is Compelling and Effective? You can make a conclusion more effective by following the few tips and ideas enlisted in this category. 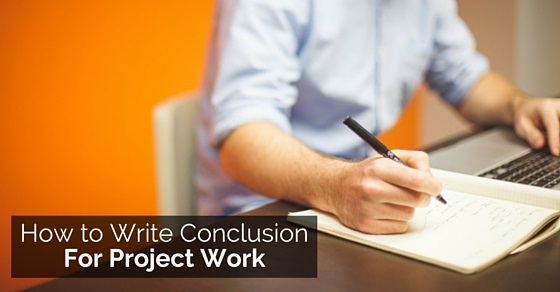 The following mentioned are few tips on how to write a good conclusion for project work. Just as we know that the project conclusion tends to become very basic, it could have some sort of resemblance to the introduction that you have mentioned in your paper. But since the conclusion is so simple, it could be important that you know how to aim to hold the information instead of just making a summary out of it. You may also rephrase the thesis and add some more points that are supporting. When you do something like this, you will be able to collect all ideas together and write properly. If you are writing a project that has several sides to one issue, then you have to use the conclusion so that you can write the conclusion in order to come up with an opinion that is logical and written by the evidence that you have. You have to write information relating to the topic so that you can back the statement but there is no way you will be carried away with all those unnecessary details. If you haven’t been able to get a clear answer then there is no reason that you should not mention this. You may instead state that the answer does exist in some ways and some sort of research could even give you more light and help your readers stay impressed. If you want to help your readers understand the topic better, you will have to help the reader read better stuff. Give them some sort of recommendation so that you can go further with some more research. An example can be used to illustrate this. In case you have been writing on a topic that talks about poverty in the third world, you should use ways in which you can help your readers understand the problem instead of just giving them a list of books to read. One more example could be about helping out or making some kind of a donation to the World Health Organization. This can help in a few treatments. Another tip that could genuinely help you while writing a conclusion is writing down a question. Now, this is something that might not be appropriate for papers of all kinds. Most of the research papers have had one treatment that is effective for the diseases and may have all the information that is needed to make an argument which is ready for the paper. If you want, you may also summarize in very brief all the answers once you have written the question. You may also just throw out the question to the reader so that they can think on their own and answer it. When we said you should ask a question, we mean that you should ask questions that are related to the issue. It was a wonderful and learning experience for me while working on this project. This project took me through the various phases of project development and gave me the real insight into the world of software engineering. the joy of working and the thrill involve while tackling the various problems and challenges gave me a feel of developers industry. It was due to this project I came to know how professional software’s are designed. The below-mentioned tips will help you start off with your conclusion. In case you haven’t really written a project before, this section should really help you. So read thoroughly, make some points before you really get started with it. You don’t have to spend a whole lot of time on restating the topic you are writing on. Most research papers that are called good will definitely make the value of the topic you are writing much more conspicuous. So you have to write some kind of defense that is elaborate on the topic you are writing in conclusion. You can also start with the help of one sentence that you would like to restate the topic you are writing on. A project conclusion example can be used to explain this. Before you are done with your conclusion writing, you will have to make a collection of all the things you would like to mention. So get a list and write down everything in brief. You just can’t start writing like that, especially if you don’t have many ideas in mind or in case you haven’t written much of conclusions before. So before you make any mistake, just collect all information on a piece of paper and then start off! Having a good idea of all the points that you will use would really be a good idea. But remember please that you don’t really need this for all kinds of research papers. It is always a good idea to address those issues that are important and that you need to address fully and explain all the important points that are needed in the body of the paper. The whole point of having a conclusion is that you will need to have a good research paper which needs to be summarized so that the reader can read. If the need arises, you could mention to all your readers that there is a need for some more research and that they should read up more on this topic. Papers that need a call of action for the readers are important but you should only use them when it’s needed. Otherwise, you really don’t have to do it. Just see whether it really needs something like this. Of course, there are so many topics that are so difficult to understand and need a whole lot of reading. It might not always be possible to write it down. You don’t always have to spend a long period of time if you are going to restate the topic. You should also always mention what is important about the topic and what are the most important points and keywords one should always remember about this. It will definitely help the person who is reading understand you better and of course… the topic will also become clear to them. You will be marked better for this also. Before you are submitting a topic, please remember to check whether you have made any mistakes. Plus you should never write it directly. Make a couple drafts after which you can write it down in a few points. Plus checking is always important. Your teacher is going to read your project, especially the part where you have written a conclusion. It is highly important. So if you haven’t checked, it could go really bad. This will be your final point! You have to show your readers that the points you have written with the examples do fit in together. For this, you might have to do a bit more studying or add some provocative quotation or insight. This brings the post to an end. Following all the tips and ideas enlisted in this post will really help you write a good conclusion for the project. Plus if you haven’t written something like this before, you will definitely find some help. If you have liked reading this post or have suggestions to give, please feel free to comment below. We would love to hear from you. Plus your questions are also important to us so don’t forget to mention them either. On that note, good luck and do well with that research paper. For your convenience, we have added a sample conclusion paper, so have a look and get an idea about it. This is a simple conclusion for the history paper.